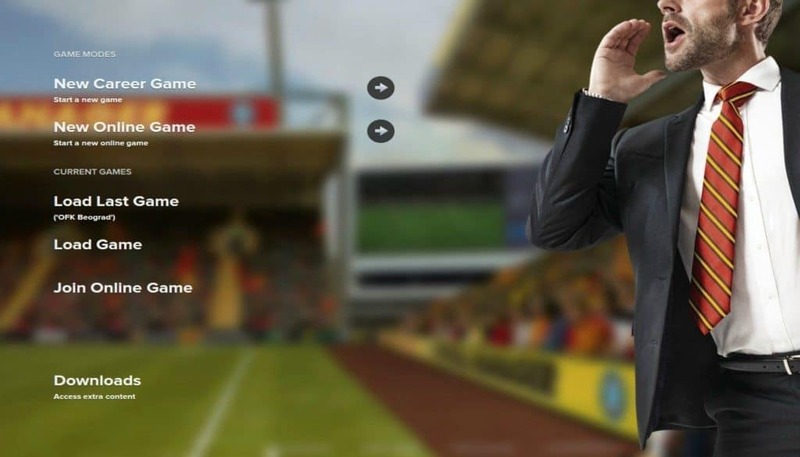 Of course, it’s an option – a new career game. 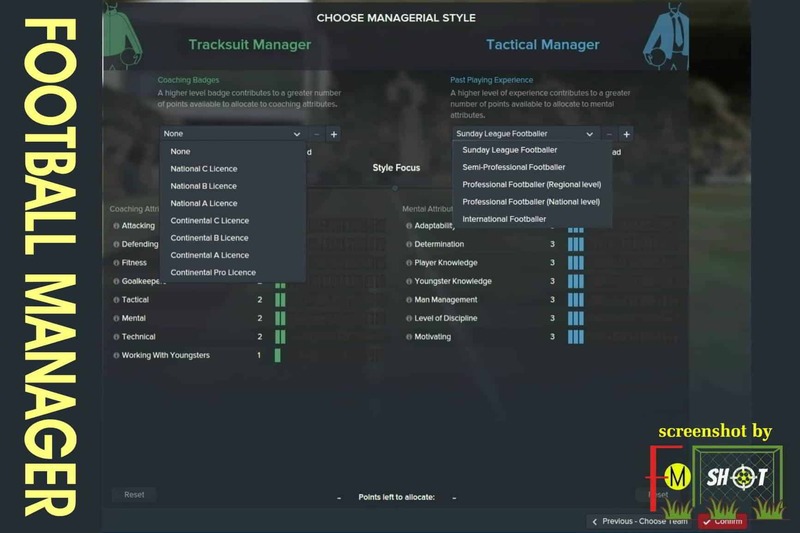 By selecting an another option (crate a club, challenge, fm touch) as a beginner you miss a lot. 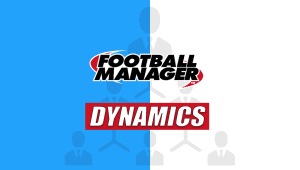 I must emphasize that I am currently playing Football Manager 2016, although I can notice that the new version is excellent. Why? The reason is very simple. Inability of watching matches (3D match) because of poor quality of PC configuration. I know that a lot of players prefer 2D and Commentary variants, but my choice will always be 3D. Otherwise, I solve the problems that I have with the graphics by choosing low or medium in the game settings. But let’s go back to the beginning of this story! It is necessary to analyze in detail the above items. Do you want to train a club/national team or change the environment depends on the results and the current situation on the pitch? The answer to this question solves the dilemma on the occasion of choosing a league. Each of us has his own favorite. But when we take the matter into our own hands, the Champions League and other prestigious competitions become easily conquerable (at least in the game). This option is ok, and the advantage is lower temperature of processor by selecting one league. Keep in mind if you lead your favorite club for a long period of time (6 seasons or more), the great football aces will have over 30 years. In time, a transformation comes gradually. 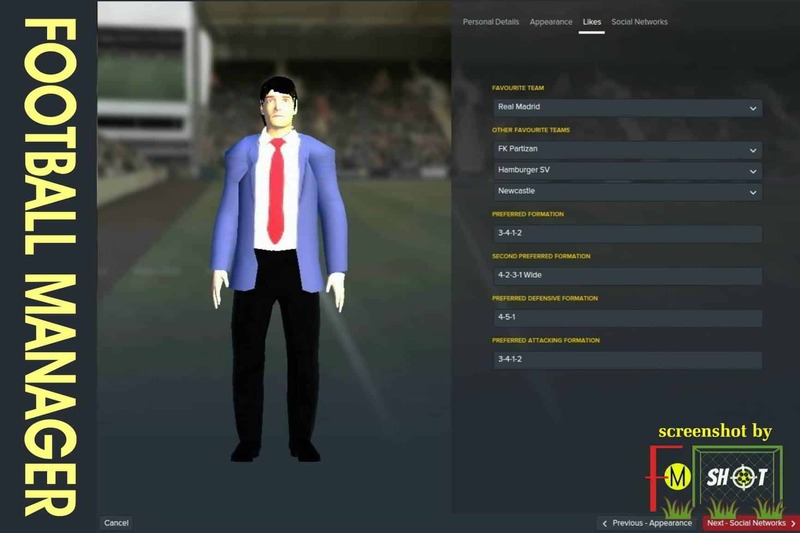 Regens (players created by the computer) get more spaces, and big names leave spikes and join the staff of a club or end their career. 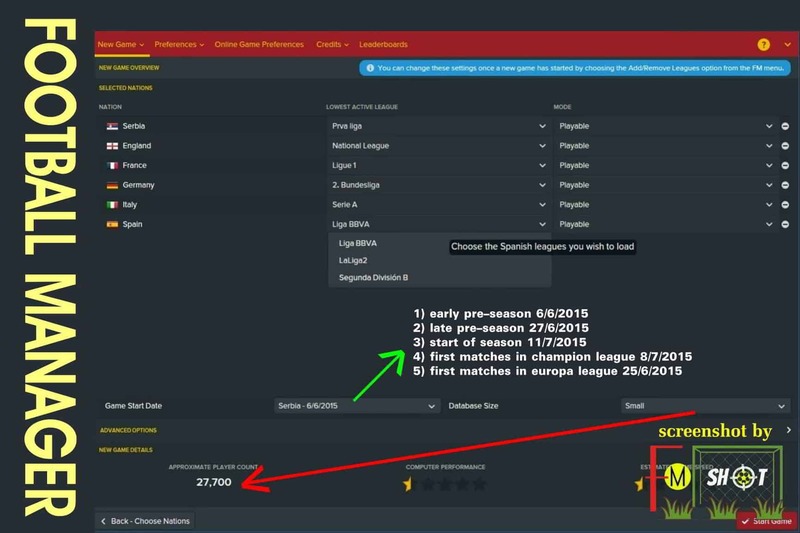 On the other side, by selecting more leagues you have the ability to change the environment (out of the country) when you estimate that is the time for such move. On the occasion of sacking, it is enough to select 2 leagues lower and the job is waiting for you. If you have enviable results after you then the offers arrive. Simply put, after each (un)successful mission begins a new adventure. 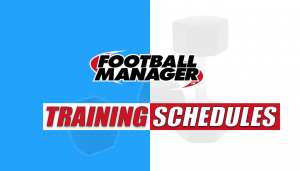 Particular leagues have a priority next to me (picture A1) and the first challenge can be – return the club to a higher rank of the competition. I am not a follower of that I have to choose a big club immediatly even if it’s my favorite. It’s better to start from bottom to top. Make a score for respect, and then the door is wide opened. In the opposite sense, you play “easy level” of the Football Manager, unless it’s a matter of an online competition. When money is not a problem, and in spite of all that you are a great trader, two-three seasons are enough to bring adequate reinforcements and fit them into a system. The period which follows after that is when the trophies come and take their place on the shelf. The next step is shown on picture A2. It is necessary to select a league which will have green light to send you a job offer of each country individually. What comes next? It’s the determination of the number of players or database size – small, medium, large. After that, there is only the start date of the game (pre-season, early or late season, first matches and Champions League/Europa League). A standard option that does not require a comprehensive explanation. 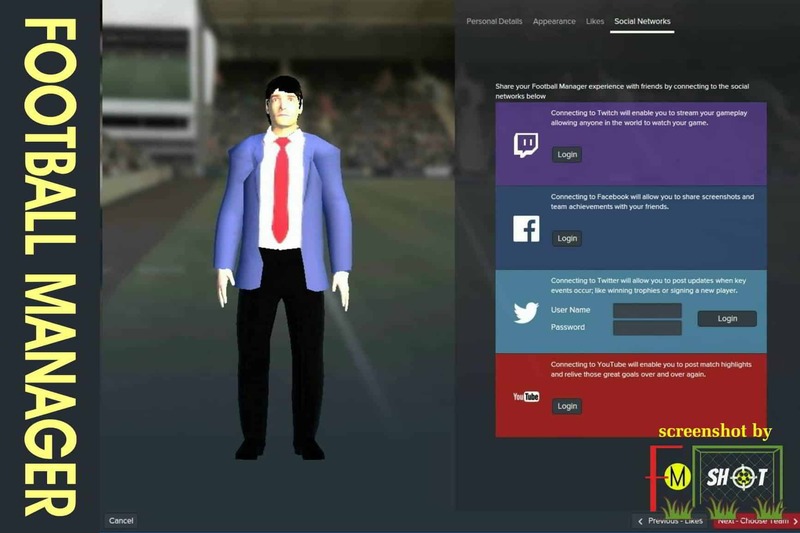 After entering of the basic data (first and last name, date of birth, favorite club, formation and foreign languages) follows a creating of your avatar if you play FM 16 or 17. The news is really cool! 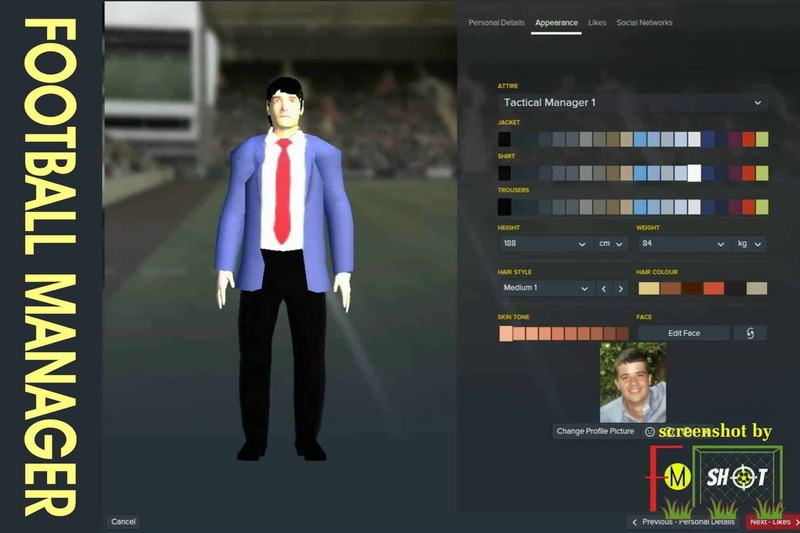 On the basis of one photo you create an avatar while in FM 16 you have to manually do the process (Picture A4). At the end we get a license and a football experience (picture A7). Unfortunately, I play football only recreational so that “Sunday League Footballer” sounds great. If it’s a license “none” it’s okay, although I think that I have some basics for National C. In my opinion a big FM experience isn’t in vain. But the game is one, and the reality is the other. If we make these steps as needed, we can choose a club or a national team. 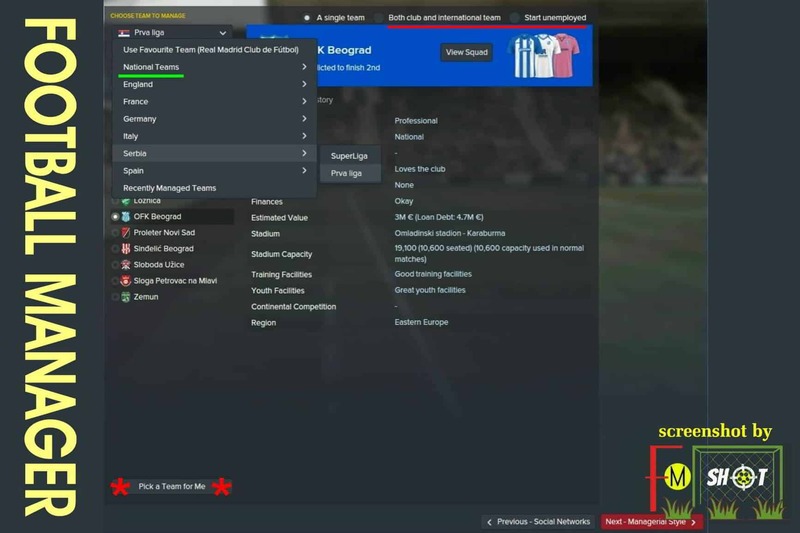 Few of us pay attention to the option “both club and international team” which is shown in picture A8 on the upper right corner as well as “start unemployed”. Of course there’s a lottery too how I like to say “Pick a Team for Me” on the lower left corner if you can’t decide. 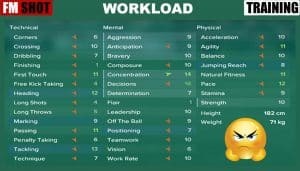 It’s ideal for two and more players on one computer who are sure of their knowledge and they want a small test – select two different leagues, and the result of success is Champions/Europa League. It’s time for the first challenge! I look for a club which dropped out of the league and has the potential to come back in order to become fear and trembling to other clubs. I chose OFK Beograd – Serbian First League. Otherwise, I am from Serbia and I know very well the good and bad sides of our football. Clubs generally have financial problems. A few teams can be distinguished, such as Partizan, Red Star, Vojvodina and Cukaricki with the potential for European competitions. Problems are arising at the moment when the main players and young talents are leaving for very little money in foreign clubs. In this way, the most of the money received, goes to the debts and settlement of current liabilities. On the other hands, I am very happy with all my heart to hear that some of our teams have made a success in Europe because I know how this path is thorny. 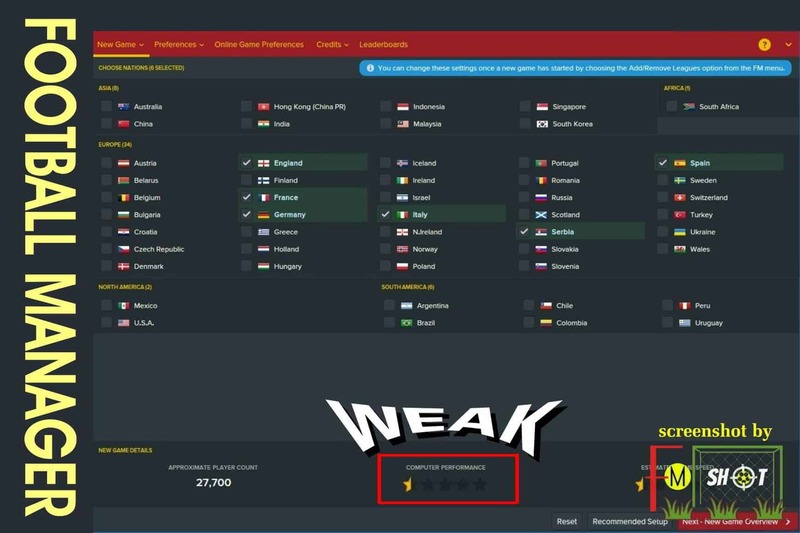 That’s why it’s nice that Football Manager offers the ability to fix some things virtually and through entertainment. Why did I choose OFK Beograd? If we look at A8 again, we will notice that the club has a stadium whose capacity is 19 100 (10 600 seated). That’s a nice number in relation to other teams. Training and youth facilities are in good condition with the indication that young people are given a little more attention in the club. The negative side is a debt of 4.7 million euros, but this isn’t a problem. A couple of good transfers stabilize the whole situation. Taking over club means a standard procedure – journalists » club management » professional staff » players. 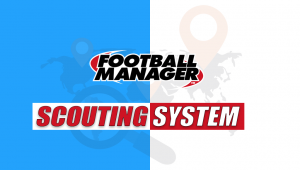 I usually spend 2 – 3 hours exploring the ground to make a system which will give the desired results. First of all, I look at finances because for an economist by profession the sides of incomes and expenses must be in balance. As I said the debt of 4.7 million euros will be quickly payed back thanks to smart transfer policy. That doesn’t mean that I will use tricks as a mean to achieve the goal. OFK Beograd has great talents! Everyone who tries to bring them into its lines – will have to set aside a lot of cash. In other words, it isn’t possible to buy cheap a quality player. After that I want to hear the prognosis of the media and fans. If the expectations are the title or top of the standings I will select immediately, one step lower on the occasion of defining goals. 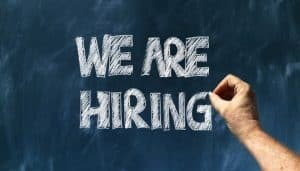 However, it is necessary to become well coordinated team, to bring adequate reinforcements and members of the expert staff. We mustn’t omit this connection between training – tactics! In addition to all that, not at all a simple task where there is no place for additional pressure. The next step is a superficial acquaintance of favorites to win the title. 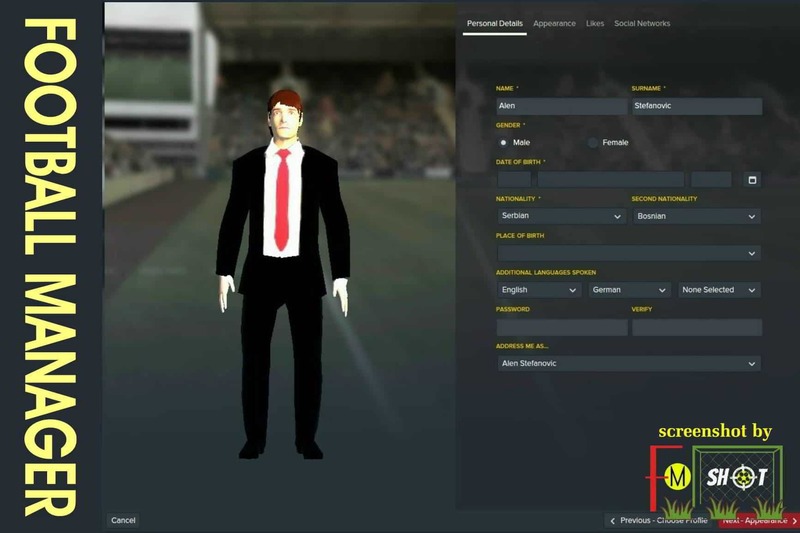 Recent versions of Football Manager don’t allow the detection of attributes which have the players opponent at the beginning. In this way, the collected informations help to establish criteria that will determine the place of player in my team. Individual qualities and friendly matches during the preliminary will solve doubts. In the same way I know that those who have a VIP pass – can train players and take care of Under 19 and the reserve team. We came to the end of the introductory presentation. From the enclosed, it can be concluded that the first chapter of this guide is written for managers who go to the first FM adventure (the mission of FM Shot). Maybe we expected something more based on the title but …. We have just started! Update: I play FM 2017 on a new PC!